Ranthambhor is plagued by the typical problems encountered by all game reserves in India - people living in and around the parks and grazing by livestock! Between 1976-1979, 12 villages within Ranthambhor National Park were resettled outside the designated park area with only a few people now residing in scattered hamlets within the park. Of course poachers continue their activities with increasing demand from China for Tiger parts. There are no accurate figures on how many tigers and poachers kill other species, but on occasion evidence appears in the form of large numbers of skins and other body parts found on couriers. The park is well staffed and the folk who man the centres and the mandatory guides - one for every vehicle, are knowledgeable of the terrain and some even know the Latin names of most species. Like oil lamps flickering in the wind, the world's tiger population is unhurriedly being snuffed out. Several books and literature have been produced to describe the most intriguing, the most powerful and the most majestic of all animals. The Hindu tradition and culture have a place of honor and worship for tiger. In India people had added Singh, Sher and Nahar on their names to upgrade their class. Yet people have been incredibly scant to the cause of the tiger. This web site aims in graphics, pictures and prose to advance the level of wakefulness and concern for this mythical and secretive striped beauty that placidly roams the jungles. Tiger Burning Bright in rare and relaxed moments exhibits it lovable beauty. It is in these moments that the sheer beauty and power of this animal comes out so mesmerizing. It is an experience that no one should fail to spot. If your grand mother has told you that cat the maternal aunt of the tiger did not teach a tiger to climb trees so he can’t climb trees then she was probably not wholly right. A commendable photographs shows that tigers can scale trees like other cats but only upto 16 months of age of after which they too heavy to do so. These pictures depict the world around the tiger and are expected to arouse passion for the tiger. The tiger is waging a lonely battle for survival – you must stand for restoring the eco-balance. 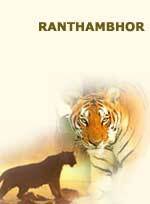 Ranthambhor is only 7 Km from Sawai Madhopur, If you are planing to visit Ranthambhor then avoid weekends and holidays.